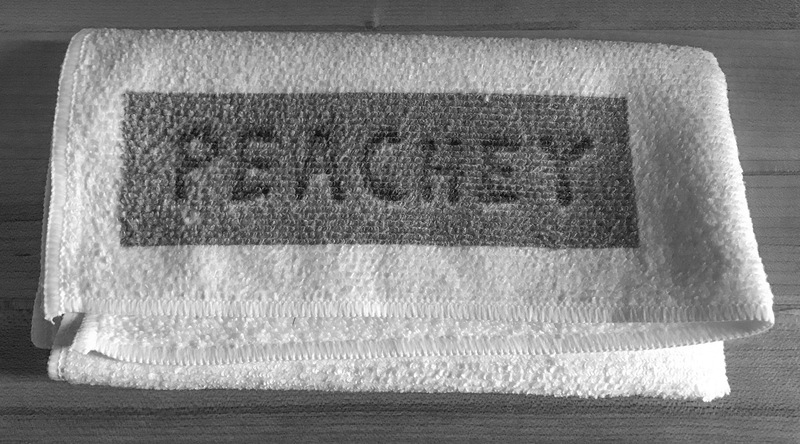 Peachey branded microfiber towel. $5.00. My first foray into merch! A stylish and practical way to show your support for Peachey Tools. This is a heavy duty, professional grade microfiber towel: 16 x 16 inches, 300+ gsm, 4-thread edge stitching, .1-.2 denier microfibers, 80% Polyester/ 20% Polyamide blend. Perfect for cleaning your knife and microfinishing film during sharpening, the floor, your cutting mat, and even removing excess grease from your nose. The dye sublimation printed logo seems durable on my sample, but it is not possible to have a super dense image on the three dimensional microfiber surface. The fibers fluff up over time: the towel in the image above was washed seven times. The great thing about microfibers is that they trap everything. The terrible thing about microfibers is that they trap everything, so the towel will turn grey over time, likely obscuring the logo anyway. But you will still know it is there! What could be a nicer gift for all your staff members, as well as a gentle reminder to keep things clean? They should be in stock December 11 at Peachey Tools. 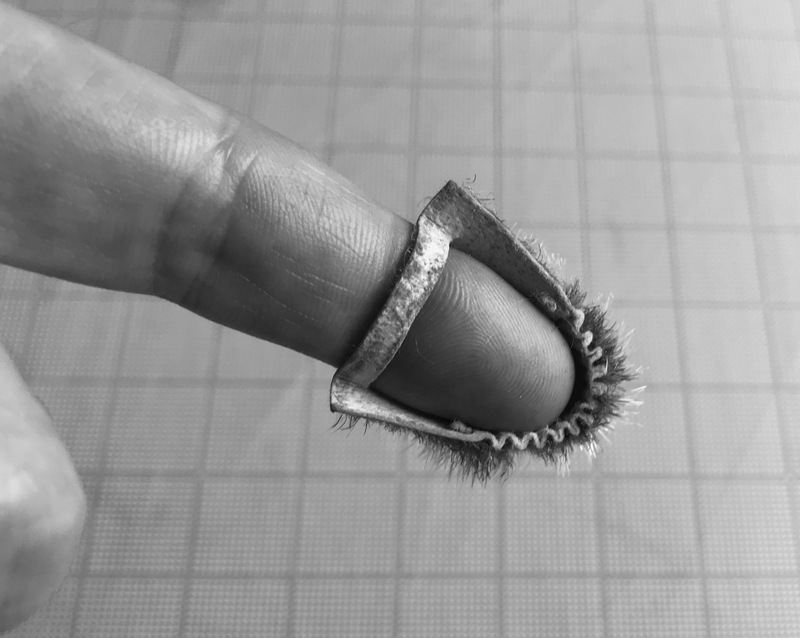 Seal Skin Thimble. You can cut the strap a bit more to fit larger fingers. Seal Skin Thimble. $5.00. A fantastic tool. Much more comfortable than a metal thimble. I purchased this one in an antique store in Adamstown, Pennsylvania, then a quick google search confirmed it is a traditional Indigenous Peoples of the Arctic craft object. The images of them are remarkably consistent, almost identical. For example, they all have a length of thread holding the crimping in place at the tip, and a clever slit that functions as a finger attachment. The seal skin is rawhide (? ), stiff enough to resist a needle head puncture, and the fur is a comforting joy to stroke if your sewing is not going well. It also makes a great finger puppet, though this can be a warning sign you have been working alone a bit too long. Available from Quilted Raven Alaska. 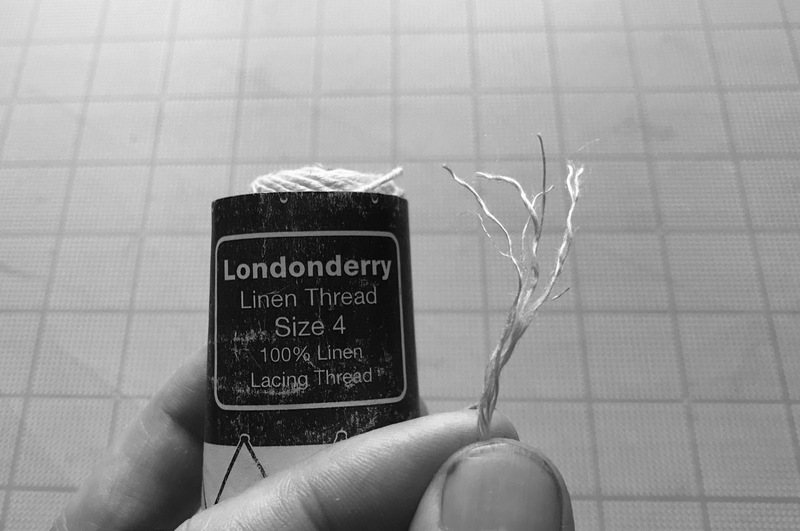 Londonderry Linen Lacing Thread. Wonderfully soft and not tightly twisted, just like older threads. Londonderry Lacing Linen Thread, Size 4. $7.00. I love this thread. Seriously. I can sew *almost* everything with it. it is perfect for joint tacketing or sewing extensions during board reattachment. Since it is loosely plied, it is easy to flatten it out inside a gathering to minimize swell. Check out this naturally packed sewing. 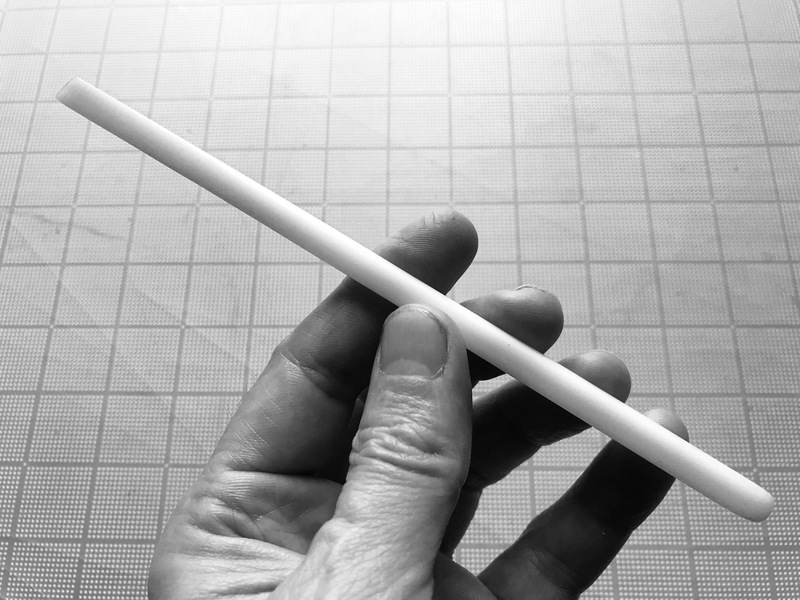 A loaded stick also helps to control sewing. The soft thickness of this thread gently supports weak or brittle paper. Mary Uthuppuru, proprietor of Colophon Book Arts Supply, is a wonderful, kind, knowledgeable supplier, a true pleasure to do business with. Available in from Colophon Book Arts Supply. Shop Knife. I’ve used this one for a number of years and altered the handle for comfort. Shop Knife Style “F”. $13.84. This is a knife that I use dull. It is a perfect size and shape right out of the box for cleaning spines and other general scraping tasks. Where it really excels is for marking binders board for boxmaking: the tip is just the right angle, and a knife mark is much more accurate than even a .3mm mechanical pencil. 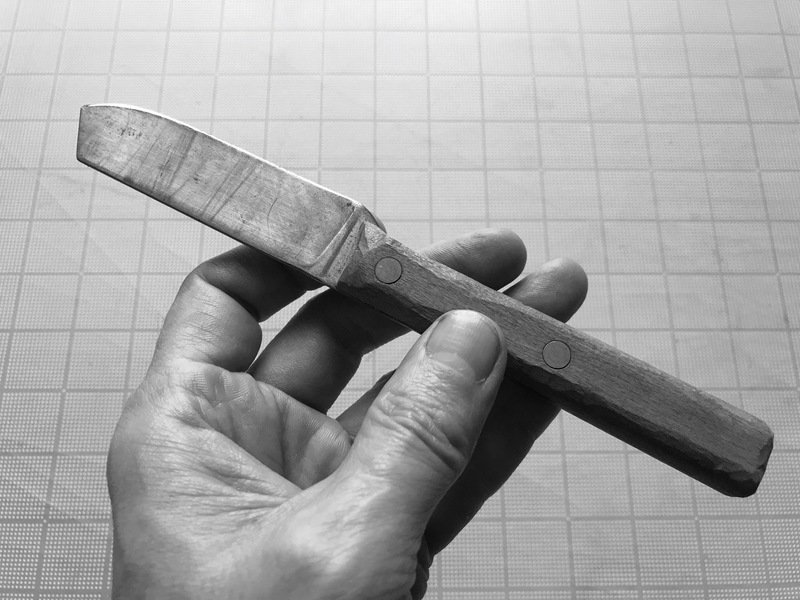 It is easy to carve the handle a bit to make it more comfortable, especially where the blade transitions to the handle. Available from McMaster-Carr. Delrin Hera. $40.00. I know what you are thinking. $40? Inexpensive? Please allow me to explain. This tool is so useful that you will end up using it constantly. 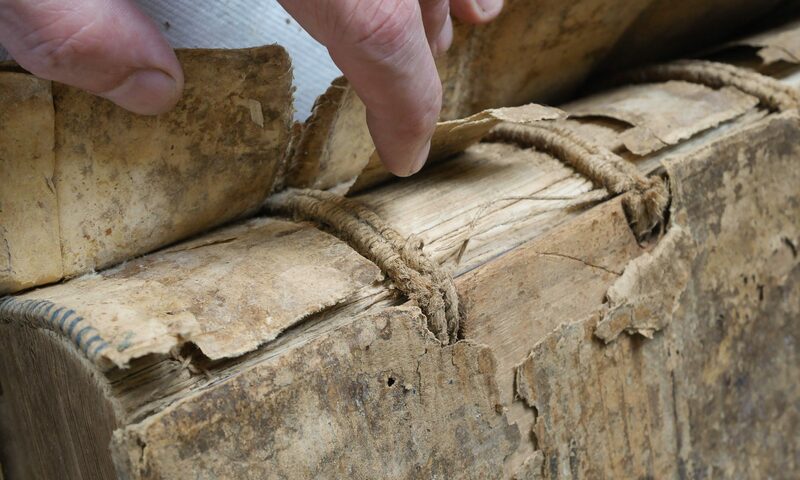 For example, it is great to gently pry some material for lifting, lift a page to turn it, insert adhesive under a detaching fragment, hold down something for photography, score tissue before dry tearing, and so on. You might like it so much you will keep it with you even when you are not working. Seriously, I use this tool at least an hour a day when doing conservation work. Therefore if you use it an hour a day, for 300 days a year, for 30 years, it only costs 4 thousandths of a cent per hour. Inexpensive or dirt cheap?! Available from Peachey Tools. Next PostNext Microfiber. Horsebutt. Bluefin Tuna. Poinsettia.